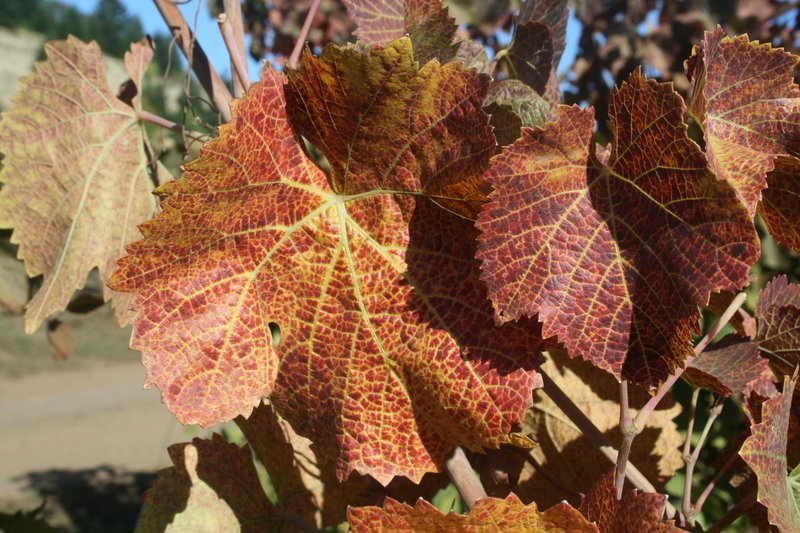 Leaf reddening caused by Willamette mite feeding on Pinot noir vines in fall, Willamette Valley of Oregon. 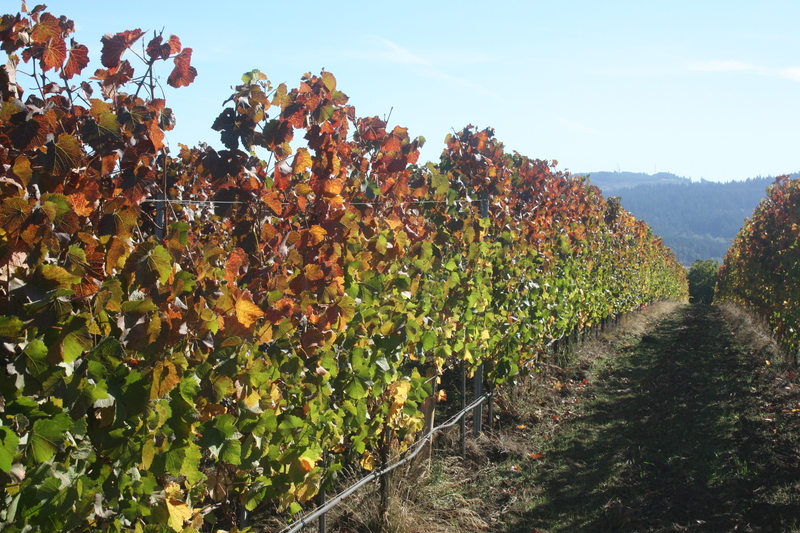 Willamette mite infestation caused reddening of leaves in the upper canopy of Pinot noir grapevines during fall in the Willamette Valley of Oregon. Photo by Patty Skinkis, OSU. 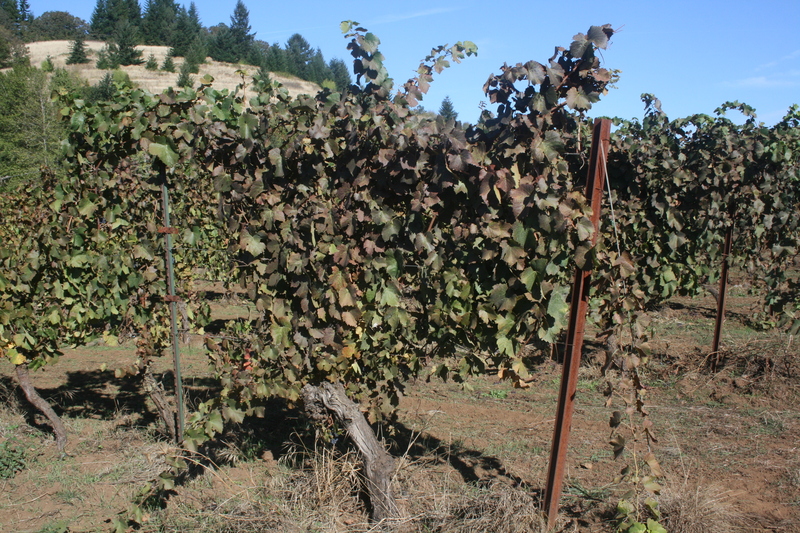 Willamette mite infestation of this Pinot noir vine caused leaf discoloration of the entire canopy during fall in the Willamette Valley of Oregon. Leaf yellowing and reddening caused by Willamette mite feeding on Pinot noir vines in a vineyard in the Willamette Valley of Oregon. Pest description and crop damage Adults are about 0.02 inch long. They have eight legs and an oval body. Female two-spotted spider mites have large dark blotchs on each side of the body. McDaniel spider mites have conspicuous white spines. 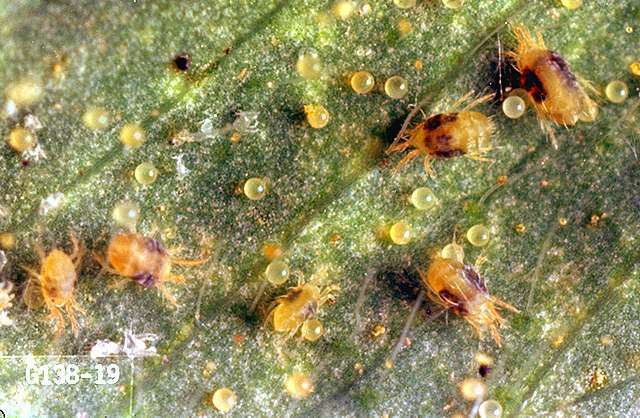 Yellow spider mites are smaller, pale yellow, and usually have small black dots along the sides of the body. In Washington vineyards, McDaniel spider mites are often predominant. Yellow spider mites rarely are seen on Washington grapes but may be found in Oregon. The Willamette spider mite has been a problem in some vineyards in Oregon's Willamette Valley, particularly in warm, dry seasons. Eggs are spherical and translucent white when first laid. Newly hatched larvae are six-legged and go through two nymphal stages before reaching adulthood. Spider mites damage grape leaves by puncturing cells and sucking out the contents. This produces small yellow-white spots on the upper leaf surface. In heavy infestations, the spots coalesce and the leaf turns yellow or red (in red cultivars). 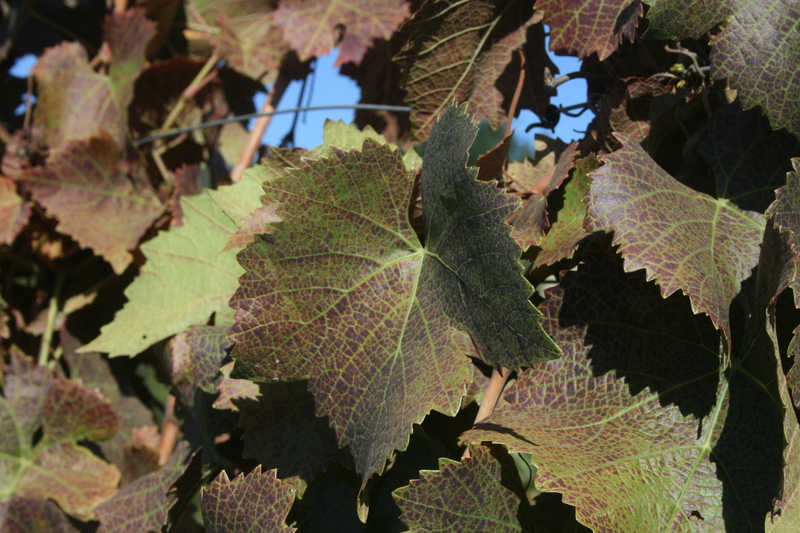 In general, spider mites are not consistently a major problem on Pacific Northwest grapes. However, when a problem occurs, it invariably can be traced to use of broad-spectrum insecticides, over use of sulfur in spray programs, or environmental conditions conducive to mite outbreaks (e.g., hot, dry, and dusty conditions). Biology and life history Spider mites overwinter as fertilized females under bark or in soil debris. They move to young foliage when buds break in spring and produce many generations from spring to autumn. Females can lay up to 10 eggs per day and more than 200 during their lifetime. Egg-to-adult development can take 7 to 10 days during summer. They thrive under hot, dry conditions. Large colonies of mites produce webbing. Dispersal occurs mainly through wind transport. Sampling and thresholds For Pacific Northwest grapes, thresholds have not been established, but economic damage is unlikely at levels below 15 to 20 per leaf. Treatment thresholds must always consider the presence of predatory mites, which are major biological control agents (see below). An extensive community of natural enemies successfully regulates spider mite populations when undisturbed by pesticides. Consequently, spider mite problems on grapes and many other crops are considered secondary pest problems resulting from the elimination or suppression of natural enemies. Spider mites are not often a problem in low chemical input vineyards or with the use of "soft chemicals." However, sulfur, which is often considered a "soft chemistry", can cause mite outbreaks when used extensively as in the case with organic vineyards. Research at WSU is investigating the components and interactions of the natural enemy community affecting spider mites in Pacific Northwest vineyards so that it can be managed more effectively. Recent results show that multiple applications of sulfur for disease management (more than five per season) tend to increase incidence and severity of spider mite problems by inhibiting the function of predators, particularly predatory mites (Phytoseiidae). Many Oregon vineyards use multiple sulfur applications per season, particularly when producing organically. However, spider mites are not often a problem for western Oregon vineyards, but problems have arisen in dry years in vineyards with substantial sulfur use. This may be due to reduction in predatory mite populations and dusty conditions in those years. Spider mite outbreaks frequently occur in more arid regions where vines are dusty and/or water-stressed. Using water or vineyard floor vegetation to control dust along vineyard roads and headlands assists in minimizing mite problems. Where competition and low soil moisture is a concern, there are short, shallow rooted grasses that are able to be used as a non-competitive cover crop (e.g. sheep fescue, 'Elf' perennial ryegrass, etc.). Excessive use of sulfur or use of certain pesticides (see notes therein) can precipitate spider mite outbreaks. Field evidence suggests that using more than four or five applications of sulfur per season greatly increases the chances of spider mite outbreaks in late summer/early autumn, particularly in warm, dry years. For more information see EB2010 Cover Crops as a Floor Management Strategy for Pacific Northwest Vineyards, WSU Extension (http://cru.cahe.wsu.edu/CEPublications/eb2010/eb2010.pdf). insecticidal soap-Complete coverage, especially of the underside of leaves, is essential. Acramite and Envidor are preferred miticides due to their efficacy and relatively high degree of safety to mite predators. All other products suppress predatory mite populations to a greater or lesser extent. abamectin (Agri-Mek SC and other brands) at 0.009 to 0.019 lb ai/a. Apply with a nonionic surfactant (NIS) for contact knockdown only. Do not exceed two applications or 0.019 lb ai/a per season. Harmful to predatory mites. Group 6 insecticide. Restricted use pesticide. bifenazate (Acramite 50WS) at 0.375 to 0.50 lb ai/a. PHI 14 days. Use at least 50 gal/a. Do not use more than once per season. Chromobacterium subtsugae strain PRAA4 (Grandevo) at 2 to 3 lb product per acre. PHI 0 days. OMRI-listed for organic use. fenbutatin-oxide (Vendex 50WP) at 0.5 to 1.25 lb ai/a. PHI 28 days. Do not use more than twice per season or apply more than once in 21 days. Do not use more than 2 lb ai/a per year, and do not use more than 250 gal/a water. Group 12B acaricide. Restricted use pesticide. hexythiozox (Onager) at 0.089 to 0.177 lb ai/a. PHI 7 days. Do not apply more than once per season, and do not exceed 0.188 lb ai/a per season. Controls eggs and immatures. Group 10A acaricide. insecticidal soap (M-Pede and other brands) at 1-2% solution; Consult label for rates. PHI 0 days. Do not mix with sulfur. Some formulations are OMRI-listed for organic use. pyridaben (Nexter and other brands) at 0.21 to 0.5 lb ai/a. PHI 7 days. Apply in 50 to 400 gal/a water. Use the higher rate to ensure adequate concentrations in mature vineyards with dense foliage. Do not apply more than twice a season or more than 0.5 lb ai/a per year. Harmful to predatory mites. Group 21A acaricide. spirodiclofen (Envidor 2 SC) at 0.25 to 0.53 lb ai/a. PHI 14 days. Use at least 50 gal/a application volume. Do not use more than once a season, and do not exceed 0.53 lb ai/a per season. Group 23 acaricide.